Of all the bells and whistles that one can find on tablets these days, "premature-birth assistant" probably isn't the first one to come to mind. 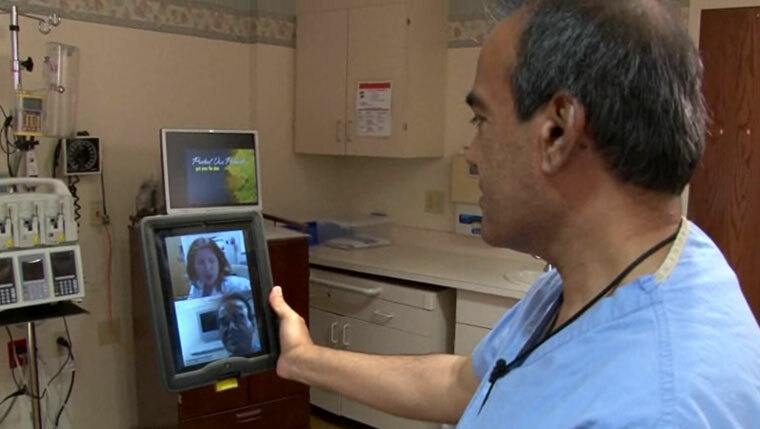 But it is the one that Natalie Jirak and her husband are most thankful for now after doctors at Mayo Clinic Health System in Mankato used an iPad to conduct a virtual consultation with colleagues in Rochester after the Jirak's young son, Jase, was born two months early. As the Mankato Free Press reports, the Jiraks decided to go to the emergency department at Mayo Clinic Health System in Mankato after Natalie started having contractions that wouldn't go away. Soon after arriving, the Jiraks were admitted to a birthing room where they were promptly informed that baby Jase was indeed on his way. The Free Press reports that Mayo's Shabbir Khambaty, M.D., the pediatrician on call that night, was brought in to assist immediately after Jase's birth. And as soon as he entered the Jirak's room, Dr. Khambaty tells the paper he knew "right away" that Jase had medical needs that were beyond what they could provide in Mankato alone. So that's when the iPad came into play. "I needed that expert help from a Rochester specialist," Dr. Khambaty said. "The first few minutes are very important. It can mean life or death." After "whisking" baby Jase away, Dr. Khambaty connected virtually with doctors in Rochester who helped to develop a targeted treatment strategy that would give young Jase the immediate care and attention he needed. "The Mayo docs helped Khambaty's team prepare, advised them to wrap Jase in plastic to maintain body heat and were able to visually examine the baby via the iPad and offer advice on how best to treat him," the paper says of the collaboration. It was the kind of team effort that Dr. Khambaty says he was more than happy to be a part of for young Jase's sake. "In my mind, I would have thought about some things, but not all of them," he tells the paper. "Once the baby is born, things can change within seconds … color, breathing patterns, when to get an X-ray, etc. Could we have done it without them? Possibly. But the outcome might not have been optimal." As it turns out, the outcome, the paper concludes, was very much "optimal" because "thanks to his doctors -- and technology" Jase is now a "regular, healthy little guy." Here more of the story in the video below. Then, be sure to let us know what you think about this story and others by sharing your comments.